Excuse me, ” Does this train have wi-fi?”. After a delicious, totally upscale, completely happening dinner at Prague’s RED PIF, Katherine and I were enjoying a superb wine and steaks when we realized we had pushed it a bit close to make our night train to Krakow – my new favorite city in Europe. “NO, ( in a thick Slavic accent) this train was built in 1960” were the last words we heard before we were hustled onto our train. Boy, if the DNA on this train could only talk. We made reservations on Czech-transport.com because the train left Prague at 10 pm and arrived at Krakow at 6:30 am. We decided waiting in airports and missing quality day time in these cities was not very time efficient or going to lead to anything fun. Would I do it again? Why yes, it was a crazy experience that we still howl about. The bunk beds were ancient , but the linens were clean and neatly mended. Needless to say the bathroom was down the hall, so we pretty much held it the entire time. All night we chugged up and down the Carpathian Mountains, banging, slamming and rumbling the whole way! I didn’t need to worry about waking up to exit the train because I didn’t sleep, though I think Katherine did like a lamb! After a very hard processed roll and a bottle of water we departed the train in Krakow. We knew our hotel was within walking distance, and we were sure we could not check in that early so we left our bags in the lobby in search of a proper breakfast. Back to the hotel though, Krakow has a surprisingly large number of luxury hotels all located in the heart of the old city. Especially noted are the Hotel Copernicus, Hotel Stary and Hotel Pod Roza all part of the Linkus group. All three have interchangeable guest services. For example ours, the Pod Roza, had a fitness center and the Stary had a beautiful spa. Back to Breakfast. I have no clue what a Polish breakfast might consist of especially after the hard tack and water on the train, but after a short stroll Katherine and I popped from a lovely side street onto an amazing central square in the heart of one of the most charming small cities I think I’ve ever seen. The square was huge and neatly lined with cafe after cafe of beautiful outside dining areas distinctly separated by cleaver dividers and spring flower boxes filled with English daisies. Though it was chilly Spring morning it seemed the whole town was out enjoying the beautiful day – and our breakfast was English traditional all the way! Following our initial first pass around the square we remembered our brilliantly arranged massages at the Stary Spa, and I am so glad we did. I usually wake myself up snoring, but not this time as I was out like a light while under the care of a very strong and professional Polish masseuse . Even the fresh orange juice was an amazing surprise! Ok, now refreshed we are all ready to go. We have unpacked in our peaceful quiet room at the Pod Roza Hotel and are off to the discover Krakow. We decided to just explore and get a casual feel for this grand city knowing the next day we were going to be visiting its very dark side. 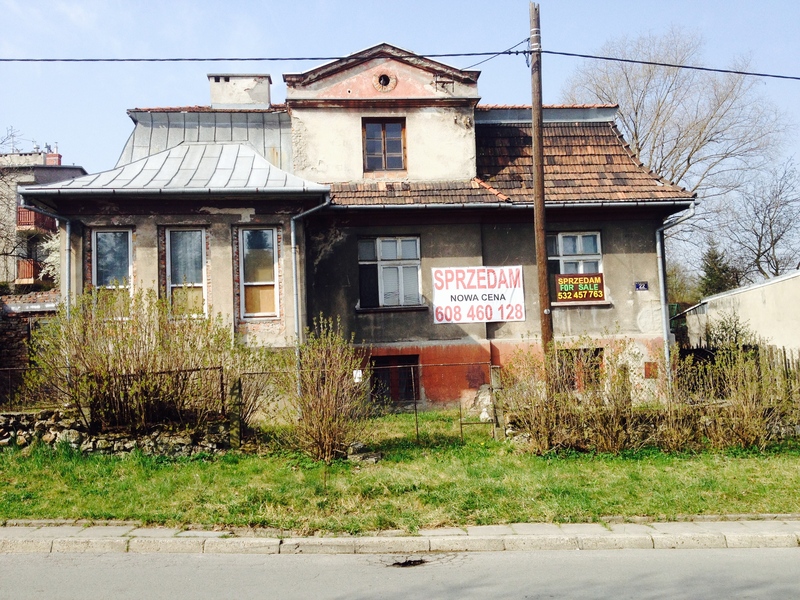 For today we wanted to see the modern, communist free Krakow. First impressions were, architectural eye candy, pristine public and private properties, and ladies wearing great looking shoes! I’ve had a lot of kabobs for lunch in Europe. First one in Garmisch-Partenkirchen, Germany on our honeymoon. It was the first time I’d ever seen the odd upside down meat hanging in the vendor’s window and the smells drove us wild to investigate . The next memorable kabob was in Lucca, Italy at the only lunch my husband and I had away from the kids for two weeks! Then came my Krakow kabob. I suppose this comes from years of bread lines and restrictions but this was the most overstuffed pocket of deliciousness I’ve ever seen. Ugh! Why didn’t I take a picture!!! Katherine and I struggled to just get through the top layer and had to call it quits barley scratching the surface but what made it in our mouths was so amazingly good! Keep an eye out for these vendors and order one right from the window. It’s a great lunch and you don’t have to lose any time in a fancy restaurant! For dessert treat yourself to a sweet from one of the fabulous chocolate shops, or stop by the candy shop at Florianska 40. 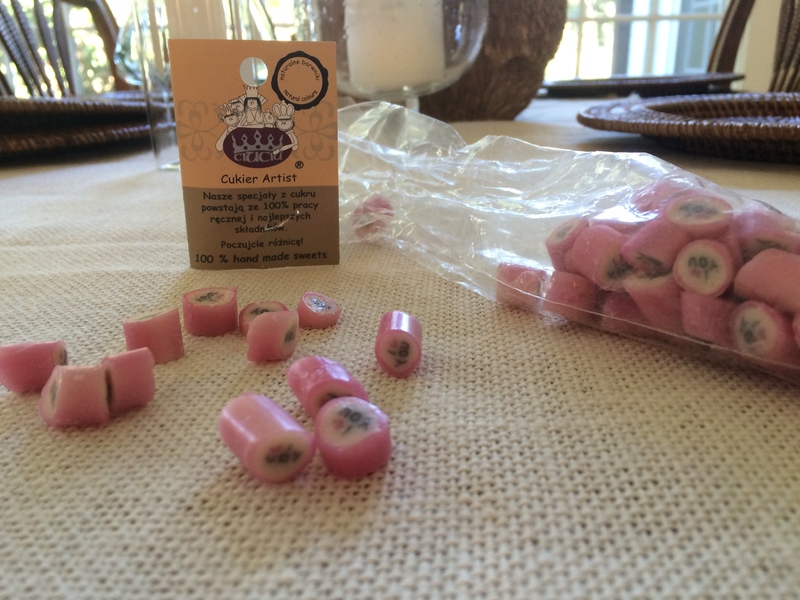 They sell tiny hard candies with a multitude of designs in the middle. They are easy to pack as gifts and won’t get crunched. Once you have satisfied your sweet tooth take a carriage or jitney ride around the square and surrounding Old Town. You will pass by the Krakow Castle ( a great 3rd day touring option), charming streets and approach the once Jewish Ghetto. We stayed in the Jewish area to explore and found a well-worn avenue lined with eclectic and interesting galleries and antique shops. There is a definite shift in appearance on this side of the city to that of the Center. Now it’s time to delve into the dark side of Krakow’s history. Katherine and I knew from past trips that hiring a reputable local tour guide is the only way to learn what your yearn to know. I also have the name of a grand gentleman if you are traveling to Normandy, France. Keep an eye out for that post. Do not board a bus with some disinterested guide giving 5 tutorial versions in different languages for 8 hours. (We did that later in the week through the Wachau Valley and we got so sick of hearing this guy talk our ears wanted to bleed!) 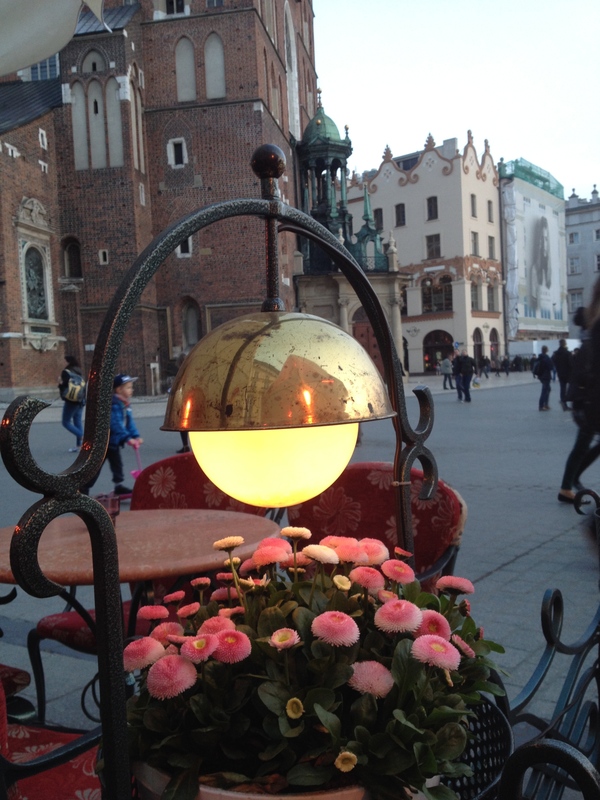 If you come to Krakow you have come for a reason and you need the best guide you can get. We spent a lot of time on this research and were greatly rewarded by a day with Tomasz Cebulski. I hope as you read about our day you will see how meaningful it was to have such an experienced, compassionate and knowledgeable leader guiding us. I am including Mr. Cebulski’s credentials and truly hope you will spend a life changing day at his side. Additionally his reviews on Trip Advisor are ALL rated excellent. Graduate of Middle East Studies at in the Department of International Relations and Political Studies of Jagiellonian University (MA in 2005) with thesis titled “Holocaust memory as the shaping factor of Israeli national identity”. Graduate of PhD studies at the Centre for Holocaust Studies at the Jagiellonian University specializing in Holocaust and Auschwitz-Birkenau. PhD thesis defended at Jagiellonian University in September 2014. Thesis titled “The chosen aspects of the functioning of the State Museum Auschwitz-Birkenau in the years 1980-2010”. 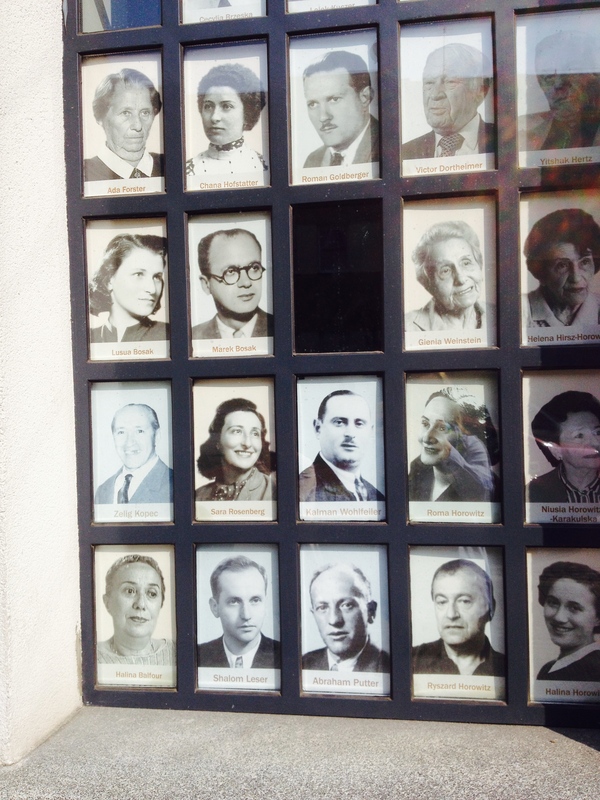 Founder and head of research in the center for genealogical research , documentation of history of Polish Jews, Holocaust education and Polish- Jewish dialogue Polin Travel , www.jewish-guide.pl . The Center works with Holocaust survivors and their families returning to visit Poland, facilitates genealogical research and cooperates in organization of educational projects for USHMM, Shoah Foundation and multiple universities in Europe, United States and Canada. Tomasz Cebulski is also an experienced and certified guide at the sites of memory and museums representing the Jewish history and Holocaust. Major research interests: Jewish genealogy, heritage of Polish Jews , Holocaust and its nowadays memory , Auschwitz-Birkenau history, history and education in the places of Genocide, politics of memory of a modern state. We began our tour of Auschwitz-Birkenau early in the morning with Tomasz picking us up at our hotel. We packed sandwiches from our breakfast bread. There are no tourist restaurants at any of these locations, just one small snack shop for a drink and crackers. 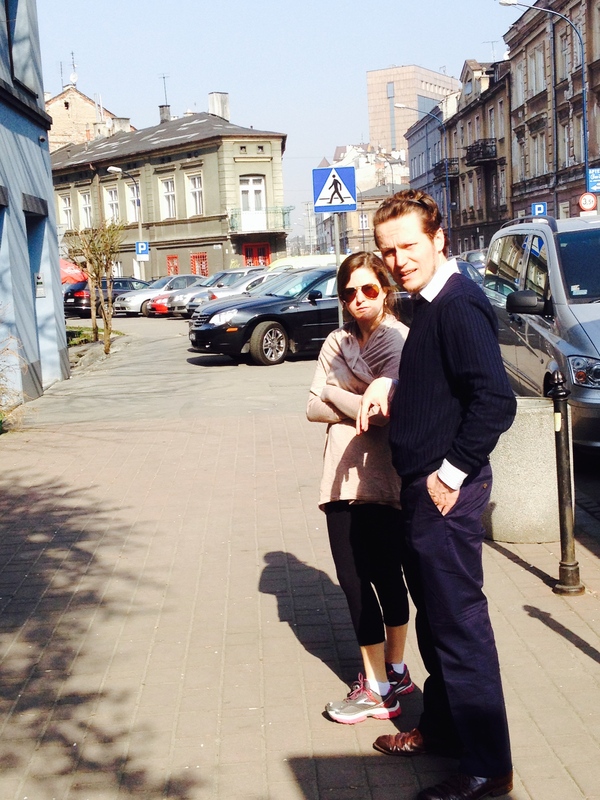 Our trip actually started right in Krakow. 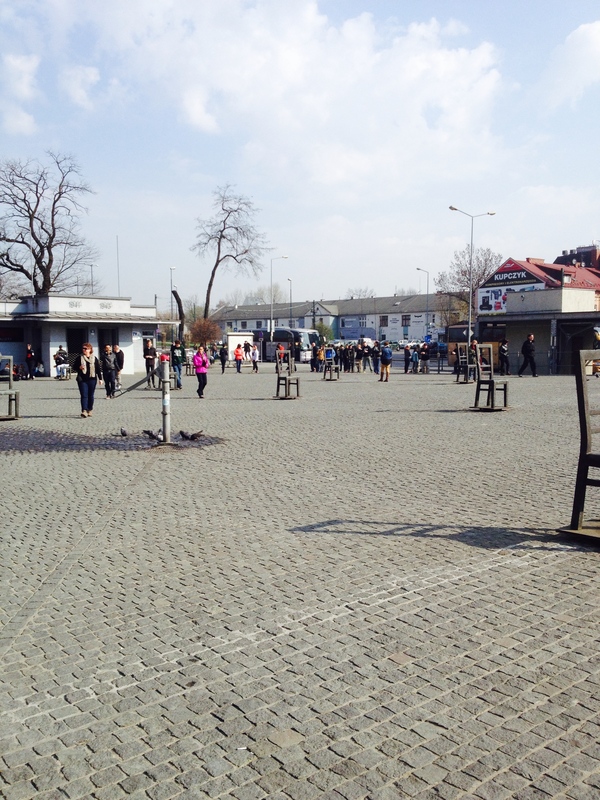 Thomas took us first to the historic site of Hero’s Square to see the only Gentile business within the Krakow Ghetto. Tadeusz Pankiewicz, a pharmacist whose shop was located at the corner of this square, was witness to the cruelties the Nazis leveled on the Jews on a regular basis. Pankiewicz, who died in 1993, was named Righteous Among the Nations for his assistance in distributing medications to the residents of the Krakow ghetto. The Krakow Ghetto Pharmacy, written by Pankiewicz in 1947 is available through Goggle Books and Amazon if you would like to learn more. In the square there are sculptured chairs positioned about as a reminding tribute of the folding chairs brought to comfort the elderly among families rounded up and brought to this square during Gestapo raids. After the deportments they were all that was left . 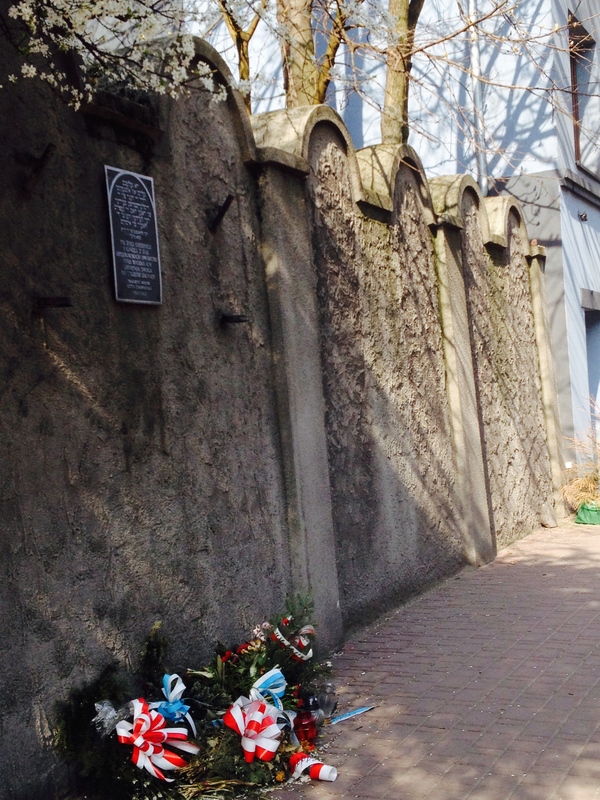 We then ventured into the actual Ghetto and arrived at the site of the only remaining section of the original ghetto wall. You can see this is a sight of great importance and daily remembrance. 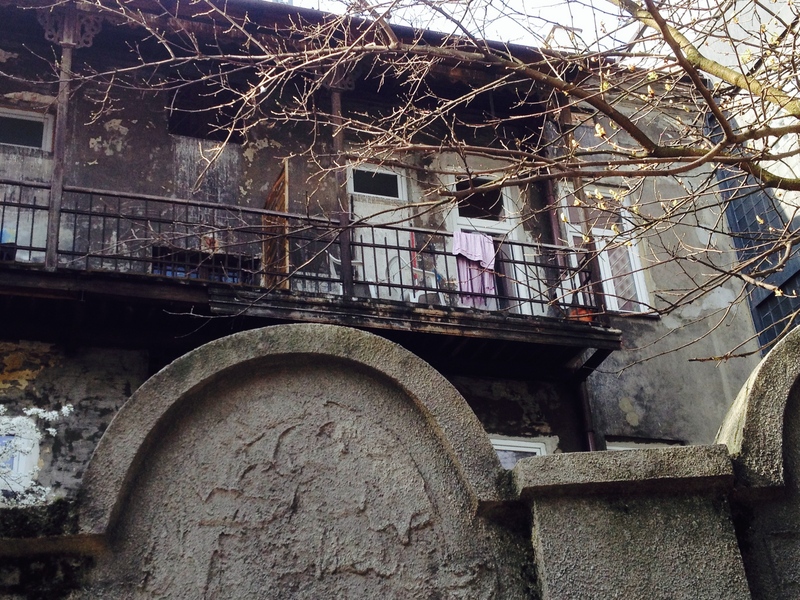 What you can’t see as clearly are the deteriorating exteriors of apartments behind the wall. Tomasz explained to us that the present day ghetto area is not as depressed as it appears from the outside rather this area remains much the same as it did in the 40’s externally because of its historic importance. I understand the homes on the inside are updated. Continuing, I guess some of you know that Stephen Spielberg’s, Schindler’s List, was filmed in Krakow in actual real life locations around town. 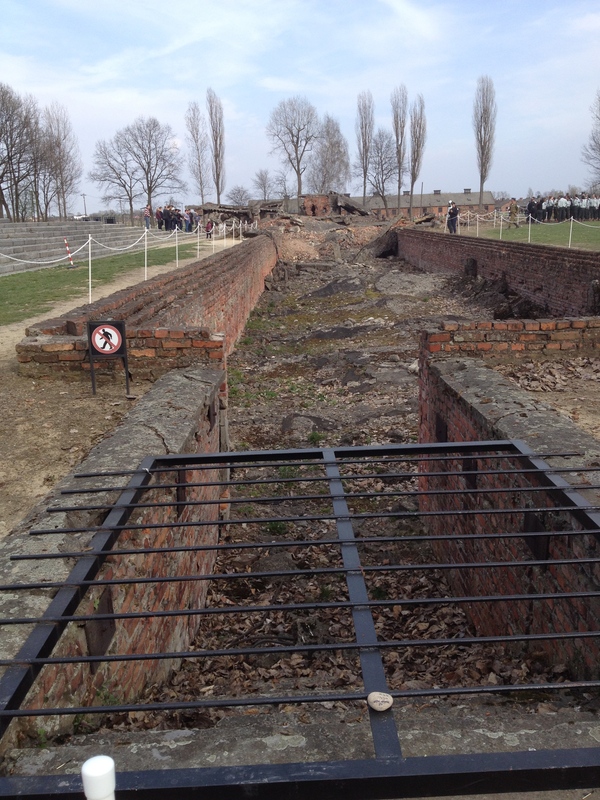 We visited the site of Plaszow Concentration Camp but in the movie it was a recreated set. The commander’s villa was a set as well. This is the home of Commandant Amon Goeth. The actual house is nothing like the villa portrayed in the film and presently it sits on the market. Can you imagine anyone ever wanting to live in a house inhabited by such evil?? 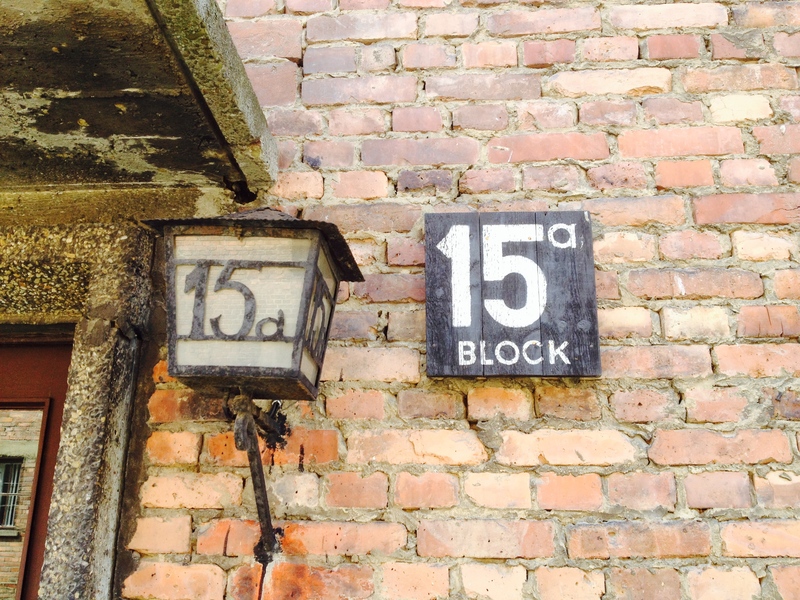 From Krakow we traveled about an hour to the town of Oswiecim referred to more infamously as Auschwitz. 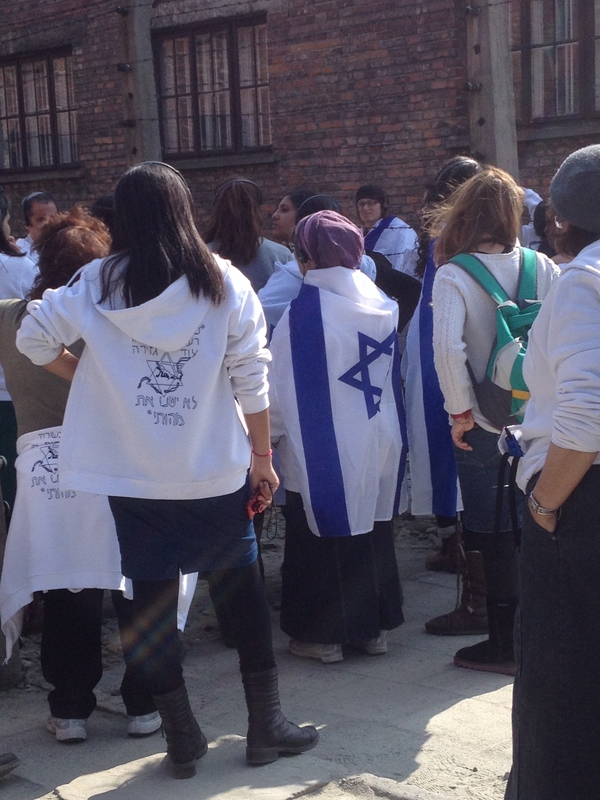 Most astonishingly, during our brief time there, we visited the oldest Jewish Synagogue in Poland. Miraculously having survived the war, services are still being conducted there. I did recently see a news story about the young people of Oswiecims efforts to change the horrible history associated with their town. If I find it I will add the story. 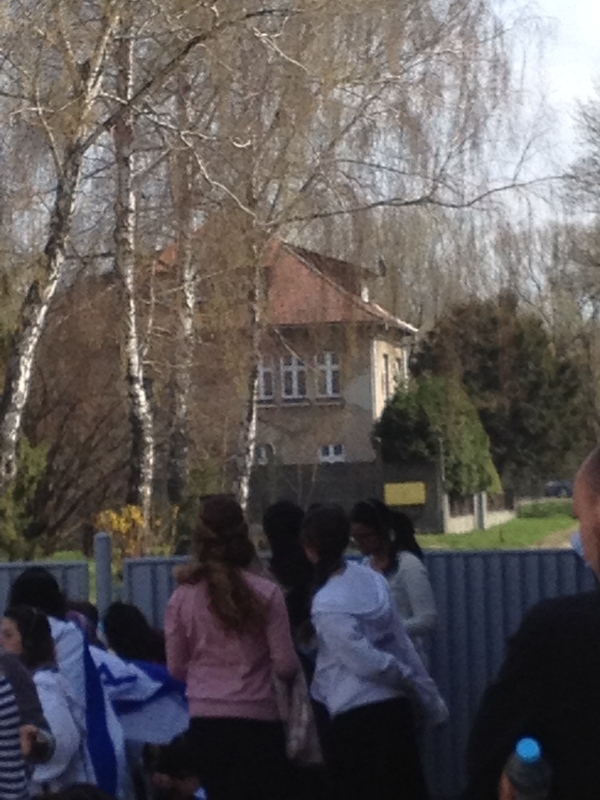 Our first stop was at Auschwitz One. This is the location of the gate with the infamously false greeting ARBEIT MACHT FREI -Work makes you free . The gate you see here is in the same location but not the original, which was stolen. As you enter you walk right under as thousands did before. 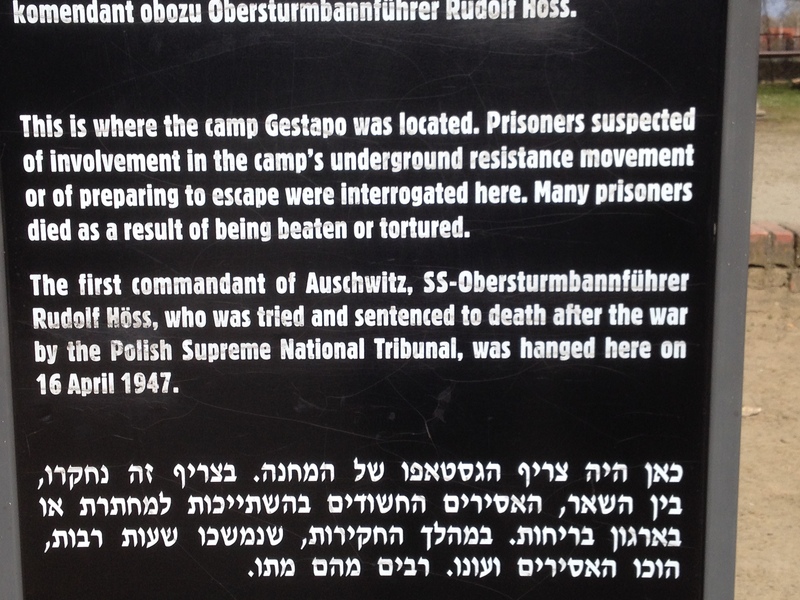 Nothing about this place is recreated, you are literally following the footsteps of the condemned. I felt my heart clutch as I watched my child, Katherine, passing through. The reverence with which Tomasz spoke while on the grounds added to the emotion of the day. At times his voice was a mire whisper. He explained that these brick barracks once housed the Polish army and then, with the occupation, the Nazis requisitioned them to entrap their Jewish prisoners . I was somewhat puzzled looking at these rows and rows of brick buildings though I had seen than many times in pictures. I realized this was not the location of what I had seen so many times in such movies as Winds of War, War and Remembrance , and Sophie’s Choice. Where was the Auschwitz from Schindler’s list? 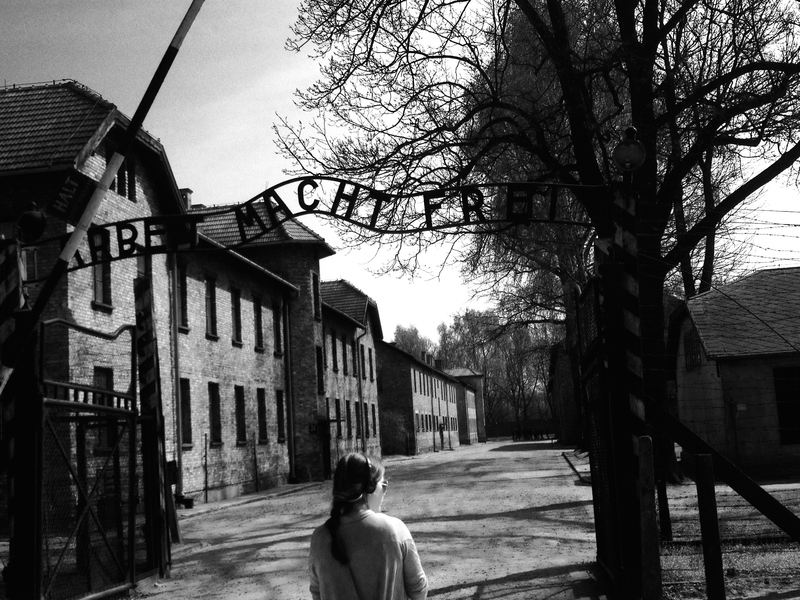 After asking Tomasz many questions, I realized there are two very distinct Auschwitz camps. Our visit to the second would come later in the day, but for now we tour the first! 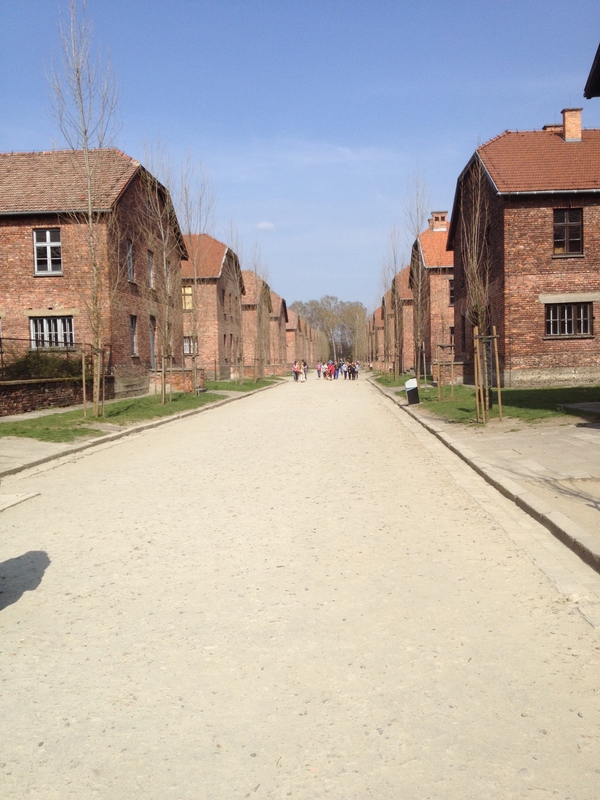 Here are some of our pictures of Auschwitz One. Long long rows of the blocks. One of the many barracks then called blocks. 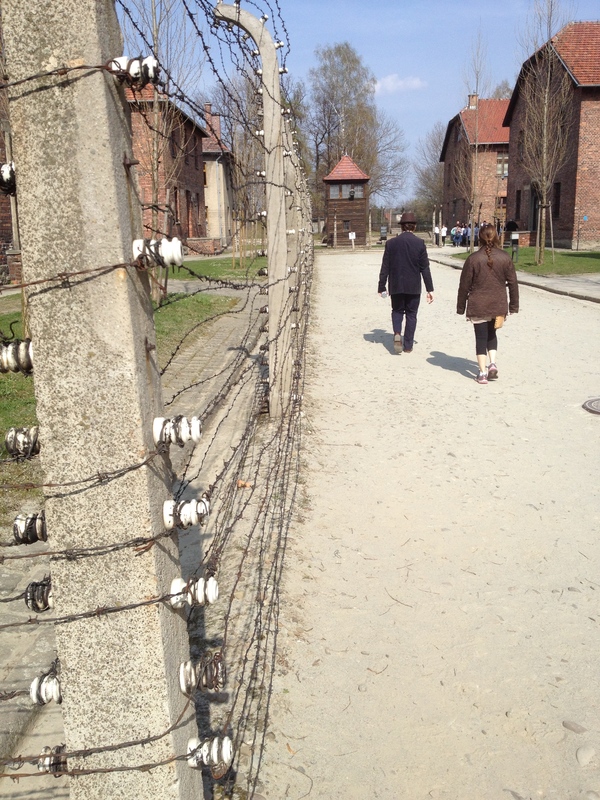 Katherine and Tomasz walking by the original electrified fences . Brave young students visiting Auschwitz One. I wondered how many of them were the grandchildren of survivors. 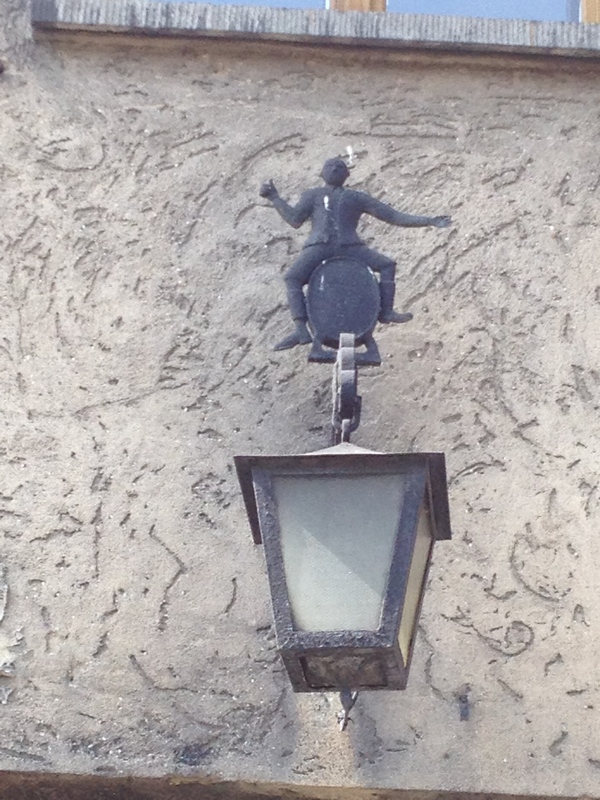 This joyful little man sitting on a keg of fine German beer is located over the door of the camp pub. Yes, while thousands suffered, their captors were enjoying a stein of beer. This is the home of SS Obersturbannfuhrer Rudolf Hoss. He actually raised his family within eyeshot of this terrible place. How did he sleep at night? What could he have possibly told his children to justify his work. This is how this horrible man died. He was hanged a stone’s throw from his Villa. 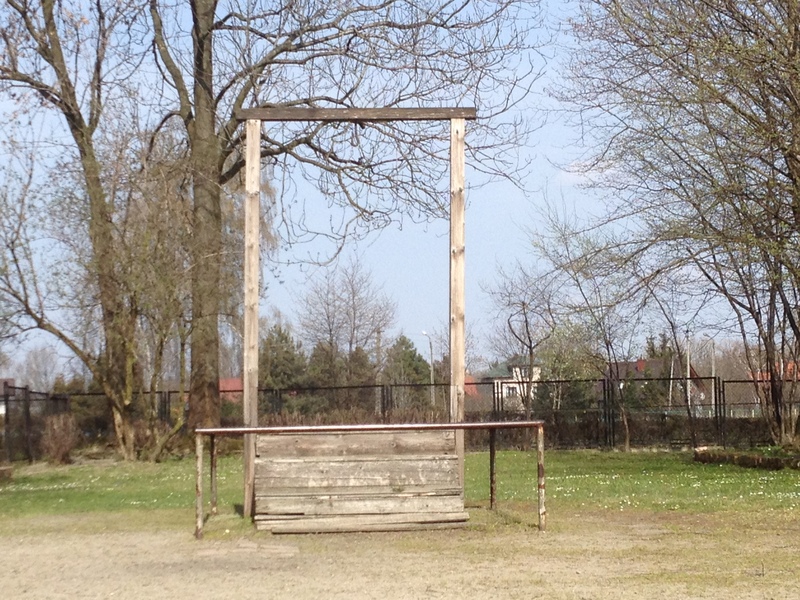 The location of his hanging. Before we continue our journey on to Auschwitz-Birkenau, Tomasz told us another story that I found to be heart breaking. Presently, there is an industrial byway adjacent to Auschwitz One. There are manufacturing companies of all types lining the road . As slaves of the Third Reich thousand of inmates worked at these factories for free of course making such companies as Mercedes, Deutsche Bank and VW very wealthy using slave labor. Sadly, there were some American companies who profited as well. Onward we traveled to Auschwitz- Birkenau on the road that follows the infamous train tracks entering the gates of Hell. 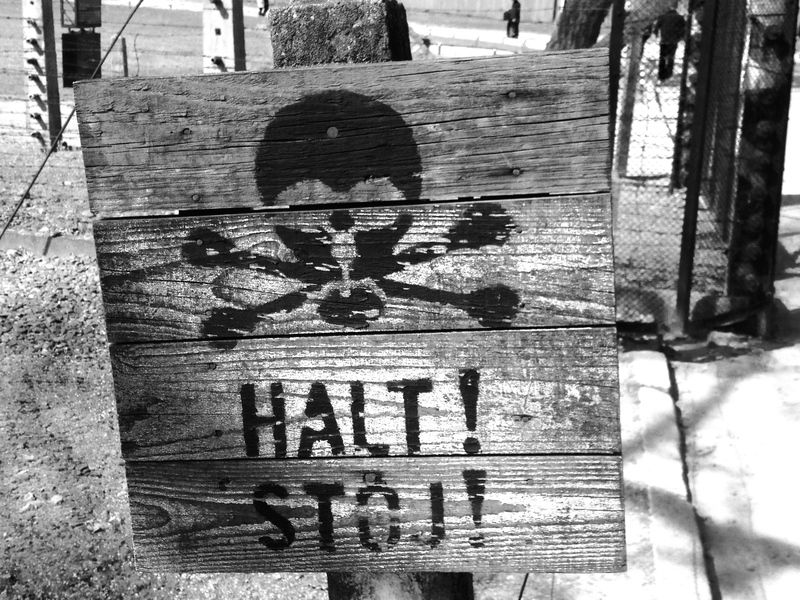 Birkeneau was a town literally cannibalized into the prison camp. All that exist of it today are a number of front doors that were requisitioned in the building of the blocks. We saw several still holding their faded color dramatically contrasting the monochromatic tones of the camp . I was a nervous wreck the closer we got and literally was trembling as we entered. As I said before there are no cleaver cafes to sit and be social while will visiting these sites. This is a site of complete reverence. No one was using loud voices, and no unruly children. Once I passed under that famous guardhouse my feeling was an indescribable sense of solitude. I suppose everyone else was experiencing these feeling in their own ways. You can pay a few sloty to climb to the top floor of the main gate. This will give you a panoramic view of what remains of the camp. Watch this video from top of the main guardhouse. While there are barracks completely in tact, there are hundreds of foundations accompanied by only the chimney which never burned a warming fire. From there we quietly strolled to the back of the camp the site of the crematoriums. As the Russians and Americans approached the camp and the Nazis were in full retreat, they tried to hide their evil crimes by bombing the crematoriums. Today all that is left are huge rectangular ruins in the ground, however the steps leading so many innocents to their deaths remain. I agonized, wondering as they ascended, how many heads turned back around to view the sun, moon or stars for the last time. Surrounding these ruins are small tranquil ponds. Tomasz in hushed words told us these ponds were where the ashes of the murdered were dumped and they are considered the final resting place of the dead though they have no tombstones. As we turned to head back to our van the audible release of breath from my lungs startled me. I knew we had just experienced a day that everyone one should have in their lives. I can only imagine the world we would live in if we were all required to visit this epicenter of evil and hatred. A place such as this, so void of human compassion and dignity, has a tremendous amount to teach the World about how off the rails we as humans have become. It is a deeply thought-provoking experience from which we could all benefit. It frightens me to look at our news today and see how easily it has and could happen again. Thank you Tomasz for making a difference in my life and for sharing your knowledge and passion of this place with us and the World. You in your own way are a man who I believe represents the Jewish saying…. Whoever saves one life, saves the entire world. History lives because of you. With one day left in Krakow before our evening train to Vienna, Katherine and I visited The Schindler Enamel Factory Museum. It is an incredibly well done, interactive, and family friendly museum devoted to life in Krakow during the 5 years of Nazi occupation. The exterior is much the same as it was during production times. 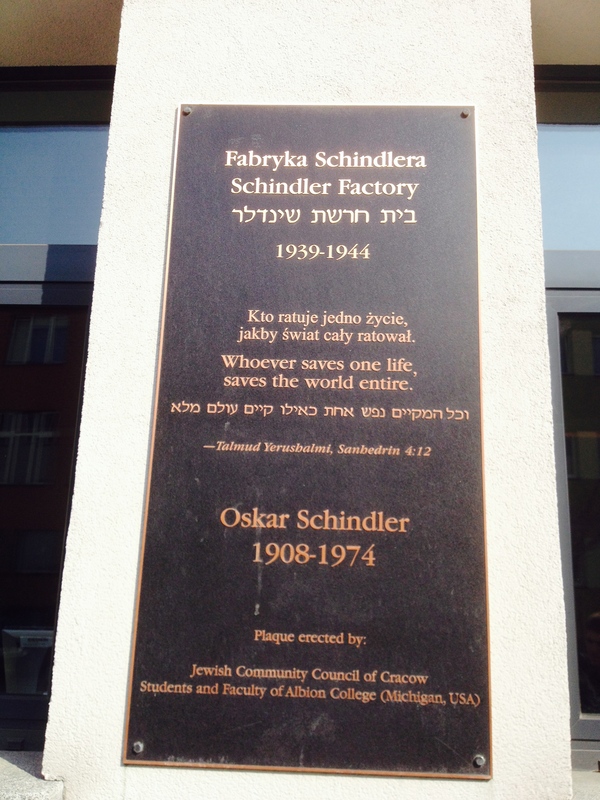 Please look for the employee picture billboard and stop to read the names of actual Schindler Jew’s who worked for Oskar thus surviving. This story is almost over and I hope you have enjoyed it. Obviously it is a tough one to write but not one to shy away from either. I will close with one light-hearted pearl of wisdom. Don’t leave this wonderful city without trying the porgies. We ate at a little cafe in the Jewish Quarter called, I believe, Momma Mis. If you find it you will dream about porgies in blue cheese cream sauce the rest of our life!!! Remember I am always happy to carry your bags wherever your travels might take you!!! This entry was tagged Auschwitz-Birkenau, Krakow, Krakow Ghetto, Tomasz Cebulski. Bookmark the permalink. Kathe, this is powerful and beautiful. Great post! This is so incredibly cool…I feel like I am right there, traveling with you, Kathe! Mom- beautifully told! It took me back to our trip and the memories both good and bad. Again, I am taken back to a tragic time in our history. You are an excellent writer and leave me to ponder even more what mankind learned from this horrid time. Unfortunately it is still evil men who do things to innocents in the Middle East and beyond. Bless you for this article.